Welcome one and all to this very lazy Boxing Day (or St Stephen’s Day or whatever you like to call it) post. To kick off, we denizens of the shelf have been honoured with an award from our good friend ideflex at Across the Bored . 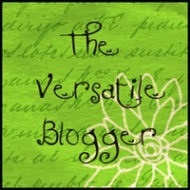 Apparently I am considered a Versatile Blogger – hurrah for me! The rules for accepting this award include telling seven things about oneself and nominating 15 other bloggers for the award. Given that it’s Boxing Day, my motivation to do either of those things is fairly low. I will however promise to complete that part of the award in the new year and possibly throw around a few Gargies with it. For now, I am just going to do the celebrating and basking in glory part of the award. For those who have a bit of creative energy floating about after yesterday’s overindulgence, you’ll be pleased to know that Fiction in 50 is on again next week, starting the 30th! Click on the button for instructions and prompt if you’d like to play along. So get those pens, pencils, half-chewed crayons or typing fingers ready and get some mini-fiction happening! I will have my contribution and the linky ready to go on Monday. Incidentally, if you are interested in co-hosting future Fi50s, drop me a line – I’d love to spread the tiny flash fiction love far and wide. I’ll also have the prompts for the next six months ready to go by then. Suggestions welcome. ← Talespins Blog Tour: Read it if and Giveaways! Conrats on the award!! Looking forward to more Fiction in 50. Happy New Year to you and the gang. Woot Woot, Congrats on winning stuff…winning is always better than wunning because that is not even a real word. Merry Christmas Sirrah.